California is the most populous state in the United States. Financial services, trade, transportation, education, health services and manufacturing are some of the prominent industries in the state. California is home to numerous colleges and universities that offer degree programs in a variety of areas of study. Those who are interested in the field of nursing can also find a number of programs in California that may prepare them for careers in the field. How much do Registered Nurses make in california? Demand for registered nurses (RNs) is likely to grow in the future, according to the U.S. Bureau of Labor Statistics (BLS). Recognizing the key role that nurses play in providing care to patients across the health care system, colleges in California have increased their educational programs with the help of private-sector investments. A bachelor’s degree in nursing is an undergraduate degree that combines clinical experience with core courses in nursing. BSN degree offers a comprehensive way to acquire necessary skills in the nursing profession, allowing graduates to take up RN responsibilities. According to the BLS, a bachelor's degree or higher is generally required for administrative, research, consulting, and teaching positions in the nursing profession. According to the California Hospital Association (2014), about two-thirds of all RNs work in various hospitals of California. Registered nurses (RNs) are predicted to enjoy a positive career growth in the state of California. The profession grew at the rate of 9% from 2009 to 2013. The U.S. Bureau of Labor Statistics (BLS) predicts a nationwide growth in the nursing sector to take place at the rate of 19% from 2012-22. California was ranked at #1 position for the highest employment levels for registered nurses in 2013, by the BLS. According to the BLS, the mean annual pay for RNs in California in 2013 was $96,980. However, RN incomes vary substantially by region. 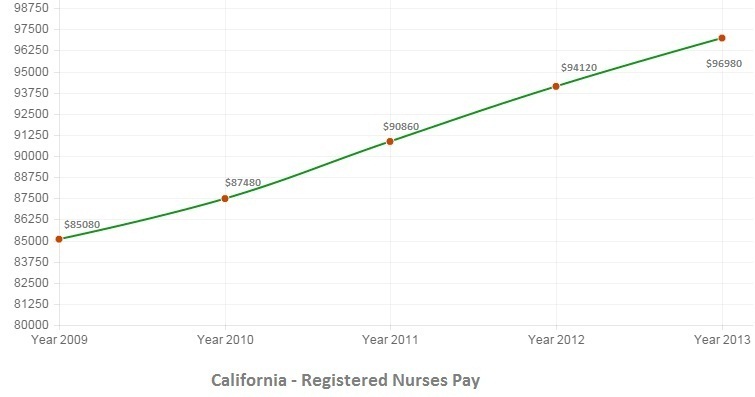 California has the highest salary figures for registered nurses. From 2009 to 2013, RN salaries grew at the rate of 14%. Q:How much do rn make in California? Q:How to become a nurse in California? A:In order to become a nurse in California, you must first complete your undergraduate education. There are three degree paths available in order to become a registered nurse: a diploma, associate, or bachelor's degree in nursing. These programs can be pursued online or on campus. After the successful completion of your education, you must pass the state licensure exam which will qualify you to practice as a nurse. A nursing license can be obtained by passing the NCLEX-RN (National Council Licensure Examination) which is conducted by the Nursing Board in California. Q:How to become a registered nurse in California?